This house was build 1725 as a typical farmhouse, behind the rampart. Besides agriculture, a backery and a tavern were part of the business. In this time, more and more salesmen, farmers and merchants used the Tavern as a meeting point to relax and maintain their contacts. Later the bakery was abounded and a brandy distillery was established. During the 1st World War, due to the need of metal, cooper and brass were impounded. During the 2nd World War and the following allied occupation, no alcohol was served and the tavern kept closed. 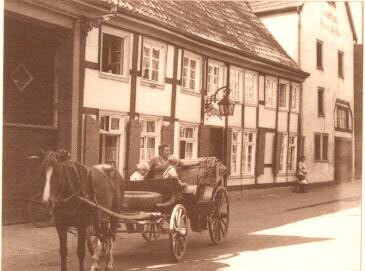 In 1949 the establishment carried on the tavern but gave up their agricultural productivity. To serve more guests, old rooms were restored to expand the tavern. In the „chimney-room“ you can see the family emblem till today. With time, the bakery and distillery were given up. 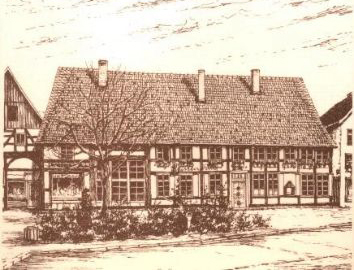 Born in an old westphalian Farmhouse and with its history in mind, only the tavern kept alive. All guests – whenever they enter – will given a place to rest and relaxe in a comfortable surrounding to meet for an amicable drink.